Thing is having 5 Aelf factions that are all small armies with very niche focuses within them runs the risk that you will get many who only play 1 of those 5. This means that GW has to release something new/updated for each of the 5 every so often to keep those gamers interested. Long term you can end up losing playesr because an army hasn't seen an update in years because you've got another 40 armies in the same game. Thing is if these players are not buying new armies, they are not a great revenue stream, so losing them is not an issue (from a business perspective), you lose gamers all the time for many reasons. You get far more revenue from creating new big exciting things and people buying new armies than you do people buying a new unit for an existing army. I agree from a community perspective its great to keep friends in the game, but that wont keep you business growing. Back when the first informed rumours of WHFB being discontinued and a new system being released started to appear, part of the information was about a change in the commercial strategy. The idea was that new releases would last only for a time, you would miss if you did not buy them, forcing you to keep buying as released. A second rumour on the change of commercial strategy rather pointed to newer, small factions being better than the bigger, older ones. At the dawn of AoS, I think these rumours proved to have some flesh to them. Older factions did get new rules, but were messy and much less adapted to the new dynamic system than say SCE or Bloodbound. But given the lack of success of AoS at launch, GW were forced to adapt. They kept their strategy of constantly releasing new small stuff, but I guess they broke with their more radical idea of not looking back to the older stuff. Even if you discount rethought factions such as BCR or Bonesplitters, the new "master BTs" show commitment to both big and small factions. And they are getting some model support, as shown by Gloomspite. I do not think either that the smaller factions are there not too be looked at again by GW. Some might get the terrain, update BT, endless spells treatment. But some are clearly meant to be supplemented. When KO third wave was previewed, the message read "this is all, for now". I would guess the same about FS and IJ, even Sylvaneth. 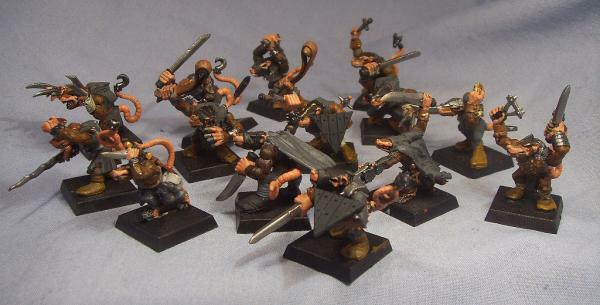 The older small factions, like Bonesplitterz, I would not bet getting anything other than spells and terrain. That isnt exactly a good point. Were people buying moonclan before the book? where they buying Beastman? People wont buy Aelfs because they are almost unplayable. Order Draconis- 3 Warscrolls Phoenix Temple have 4. And currently those are the best options. It is inviable and cause people not to buy those kits. Give it a book, traits, options and people would buy. There is a very good number of plastics on all ranges of Aelfs. Now if you have a single big army with focuses within it then you've got only 1 army to release an update for. Even if the new model is niche within the army there's a greater chance that more of your fans will buy it. Plus they dont' get that "I've been ignored" attitude as fast. So now you've got fewer armies, with diversity within them and a greater chance of players buying more models and changing their tactics. Gits and Skaven show this perfectly. You could have 5 or 6 Clan armies each with their own book and rules. However a Pestilens player might only play Pestilens. They've less encouragment to start other Skaven forces because of the allies limits. If they want to go Clan Skyre its not a slow evolution its a full "new army" approach. However put them in one book and now even though there's only 1 new model it counts for all the Clans; there's more chance that a Pestilens player will steadily add more and more skyre or Moulder and then widen their collection. Mechanically you end up with roughly the same; you still have themed armies on the tabletop, but behind the scenes you've got far more encouragement and potential to have more money spent on factions and fewer factions in general to update. This means more regular updates for each army, that means happier more content gamers and more purchases. It's basically win win for all involved. I sort of think Gloomspite must have been a test run of sorts where they resculpted old models. If that sold well, I bet we will see a ton more like it (just AoSmogrified). I don't really know how we (the community) can know this without just being patient, which is something I lack haha. I wonder if it is time for GW to just tell us what the plan is for armies. I know they want to sell old kits as long as possible, but man it would be a solid to do for the community. Don't need to know models, or spoilers for books, but just the general idea. @Jamopower I don't think we'll ever see Idoneth combined with Dark Aelves or High/Light Aelves, lore wise they are more than likely too different at this point. It makes sense that they would ally with one another (although I don't think they'll be able to ally with Light Aelves considering their history with Teclis) but the Idoneth are primarily isolationists, there would have a pretty massive event happening story wise to get them to permanently join with another faction and when you couple that with their need to remain unfeeling because of the trauma inflicted on them inside Slaanesh I just don't see it happening for anything less then Slaanesh being released and a permanent fix found for their broken souls with the help of one of the other aelf factions or even Teclis himself. If we're looking at units the way I see it there isn't much benefit to them being rolled into another faction, all they really need is for Embailors to be made a unit with a bunch of different monsters to fill in any of the gaps the current Idoneth range has as well as give some more unit variety. That along with some endless spells and as far as I'm concerned they're done for this edition. I never meant real combination. Got bit sidetracked from my original "thesis", which is that people who like elves will get the elven armies. Maybe not all of them, but having a new elven (or dwarven, or undead, etc.) army every now and then, will keep large enough amount of them buying new stuff and more importantly, will get new people interested. That adds up to more money in the long run than giving a new book and unit or two every few years. The fact that you can field them all on the table is a plus, but not anyways necessary. I'm pretty sure that quite a big share of the people that walk outside of a Warhammer store with bag full of boxes don't have a clue what they have bought in terms of gameplay, but they are very sure what they have got in terms of looks and in that way having your elves in a forest or in a sea theme doesn't have too much of an impact, if elves as a grand theme is what you're interested, compared to being interested on, say, dwarfs. Into the skaven release again i think we will see new sculpt for eshin soon. There weren't showed in any photo or picture right now. Also the deathrunner from ST could be included in an eshin revamp. I'm not convinced things are as you think. I always perceived Legions of Nagash battletome as a kind of excuse, temporary solution. It was like: "people really want some Death stuff and we have literally nothing to show them for X years. Let's throw them a battletome that will satisfy their hunger for a while". I would agree with you if new models from across all Death subfactions came with the battletome release. That would make things clear "Death is Death, united". The way they treated Beasts of Chaos I see as a decision between "do we abandon that range or at least we make a battletome?". Battletome alone increased sales of some BoC models so it was worth the effort but there was no signal as if they want to expand the idea of BoC. Except for the spells no new models were released. Gloomspite is again a different thing. In one part it's a brand new release (Moonclan) and the second part is pulling things together. If you were right then we should not see any new Death factions like Nighthaunt (which came after the LoN?). I still think that at some moment in time we will see solo Deathrattle battletome and maybe other (Vampires?). And I can see something similar happening for many factions. But sometimes it’s better to have at least some kind of an release which make the armie much more enjoyable in playing, then to have to wait another 3-6years. edit: also Bringing a few armies back together, isn’t bad at all. Yup I agree with this. I also think there has been a strong demand for people with models for certain factions to have an army book of sorts and I think these sorts of books are ideal. They give players what they want but also allow GW to address the range and remove anything they aren't interested in producing (due to sales, complexity in manufacturing/something has happened the molds, or supporting from a game point of view with point updates and how the models interact in the game). I think with the minimalist touch as well it means that they can put more effort into the newer things they are working on as well. I also suspect they are doing a lot of investment behind the scenes, which probably requires a lot of resource for (word is they are looking at new generators, manufacturing equipment, ERP system, etc). Anyway, less of this talk and more rumour type talk. We have the LVO Preview happening this week (which I'm surprised about as I thought it wasn't happening), so we should be seeing lots of cool stuff to discuss. I think it will have a strong Chaos focus if I'm honest but let's see what happens. On another note, Martin from Warhammer TV has said on Twitter they will look to see if they can get a Skaven vs Flesh Eater Courts match on Warhammer TV. 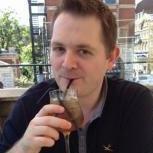 He's not confirmed if Ben Johnson will be playing both armies due to Ben being a massive fan of both. Malerion, Alarielle, Tyrion & Teclis. Then you have a set of Allegiance abilitites which are available to every faction of followers. Once you chose your "Stromhost" you get one additional Allegiance ability. 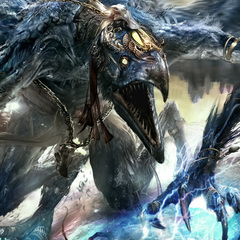 I imagine it like this: You can add any aelven subfaction you like to your army which is aligned to one of three gods. Example: You pick a Darkling Covens unit for your "Stormhost" which follows Alarielle. Now Alarielle stands for Nature in this case (and pretty much everything wanderers are). So they'd now get a effect that reflects their darker being in combination with nature: They can deepstrike due to guerilla ambush tactics, or sth. of the likes. While Wanderers might get increased shooting capabilitites. You could compare this with the Bad Moon Effects which buff different units differently though the buffs differ from god to god for every subfaction. What day is the LVO Preview? That FEC book looks pretty thin, obviously its just a mockup render but hope its got some reasonable content. Was quite disappointed when my Nighthaunt book dropped through the door on release day, felt like it would double in thickness if they included the 4 pages of rules. @Aryann I think that's more because most old world races started out 30 years ago or so. So when they started they were one trick faction focused armies. Over time as GW added more models the number of tools and themes each army had increased over and over again. Skaven are a prime example of an army that has steadily grown and grown in variety and diversity through its range. Er, no they weren't. If anything they became the complete opposite, with certain armies becoming more "one trick" or playstyle focused over time. When Warhammer first debuted as a mass fantasy battlegame (with an RPG/narrative focus and GMed games advised) for people to use their collections of Citadel Miniatures in, the first army lists were pretty samey affairs divided by race, with each list having access to combat characters, heroes, troops, elite troops and cavalry, all of which could be armed with missile weapons, generic monsters and in the case of most lists an artillery piece, all only really separated by a basic statline. It was as the setting and it's inhabitants began to become more fleshed, that some armies slowly began to narrow their focus and settle into a gameplay niche -Dwarfs losing cavalry and then wizards, Chaos losing access to missile troops, and Bretonnia becoming cavalry charge focused and losing (then regaining) artillery being the easiest examples. Yes, you could obviously argue that with the setting's development and expansion you were greeted with a greater variety of units, but not playstyles or battlefield roles (let's face it, White Lions, Swordmasters and Phoenix Guard are all High Elf elite melee infantry armed with double handed weapons). There have even been instances of entire swathes of units and options being dropped from an army list because they didn't fit with the people at the top's vision of the setting, the most notable probably being the launch of 6th edition when halflings, Empire War Wagons, Kislevites, Imperial Dwarfs, Imperial and Orc and Goblin Ogres, Forest Goblins and Spider Riders, and Wood Elf chariots all went bye-bye (though to be fair many of these remained available to their parent armies as Dogs of War if you didn't mind giving up a rare choice for them). 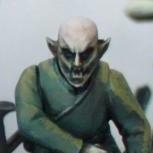 It's interesting that you use Skaven as an example - Skaven were the first instance of a fully fleshed out army being added to the game, and having developed less organically than the others (not starting out as a Tolkien/historical/fantasy trope pastiche) have kept much of their original structure and MO. When Skaven first deubted they were a cowardly horde army, with lots of powerful special weapons prone to going wrong, and included Grey Seers, Warlords, Warlock Engineers, Assassins, Stormvermin, Clanrats, Slaves, Warpfire Throwers (RIP 😟), Poisoned Wind Globadiers, Plague Monks, Moulder Beastmasters, Giant Rats, Rat Ogres and the generic monsters everyone got - that's a bigger selection of troops than most new AoS armies get on launch, and really your core Skaven, with every new unit monster or hero subsequently introduced being a variation on one of the originals. It's the same price as the Skaven one and will likely have a loooot less warscrolls, so I'm hoping for lots of juicy background content! Imho, they need to bring all armies under AoS 2/3 settings (lore-wise and gameplay-wise). Make it clearly what they want to do with AoS. That doesn't mean to stop any new faction, GW can do whatever they want. They can merge all Aelves in one battletome, and next year build a new army like DoK and take Aelves from last battletome (or 2 keywords). Even swap units between Grand Allegiance (ogors and fyreslayers!!) and even put some mercenary rules in the White Dwarf. The customer need to feel that he/she is buying products for AoS, and GW know that (and I'm not talking about money). 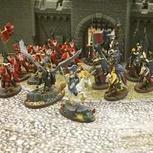 Someone that just bought an old WFB army and feels that his/her army doesn't belong to AoS is something that will hurt in the long run (they need to kill any shadow from TombKings and Bretonnia ASAP). There have even been instances of entire swathes of units and options being dropped from an army list because they didn't fit with the people at the top's vision of the setting, the most notable probably being the launch of 6th edition when halflings, Empire War Wagons, Kislevites, Imperial Dwarfs﻿, Imperial and Orc and Goblin Ogres, Forest Goblins and Spider Riders, and Wood Elf chariots all went bye-bye (though to be fair many of these remained available to their parent armies as Dogs of War if you didn't mind giving up a rare choice for them). Imperial Dwarfs? Imperial and Orc and Goblin Ogres? Explain please! edit: I think that was 3rd edition, 4th actually let you take them as part of the army. edit 2: https://boardgamegeek.com/thread/430528/look-empire-list-3rd-7th-edition list of all the available imperial units for each edition. You used to get units of Halflings, Ogres and dwarfs in an Empire army. They were in the list, not allies. So you say that GW managed to make KO player even more grumpy ? With this discussion few questions come to mind: how many factions are planned? Is there a plan at all? How many factions can rules team balance? How many factions can GW support (rules and models when next edition of AoS comes?). I wouldn't mind if new releases where endless but then I don't want a situation where older factions are being forgotten. I'd rather all factions, from Fyreslayers and Ironjawz to Aelves and Chaos received new rules and models every 2-3 years. I just wonder when GW will say (if they will) "ok, that's our last new faction. choose from what we offer.". Darn it GW hurry up and give us that studio preview! It's a long wait until 9pm USA time Thursday!! I actually think GW should go forward with a mix of diverse 'mega-factions' (Legions of Nagash, Skaven) AND smaller niche offerings (Sylvaneth, Ironjawz), obviously sticking with the middleweight class too (Idoneth Deepkin, Seraphon). There's an appeal in both an expansive sandbox and a niche, distinct faction identity. 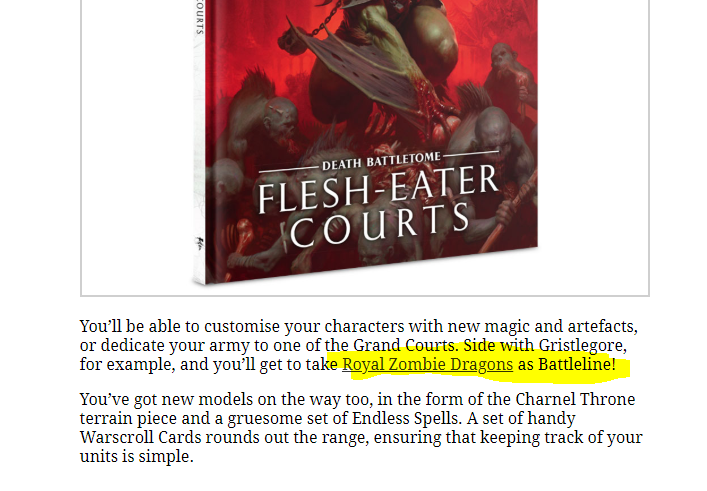 But, and this is where it's just my opinion, there comes a point where certain factions like the 4 Kit (plus 1) Flesh Eater Courts just don't have enough 'meat' to them. Proper fixes for this becomes modifying the lore to fit with a 'merger' or supplementing the faction with fresh releases (which with FEC they're trying, and the debate is whether that's enough). It's making me wonder about the Duardin/Ogor rumours we've been getting. There's a similarity in that both old world armies have been fragmented, with at least one splinter being a codified AoS army which has been criticized for its lack of diversity (Beastclaw Raiders and Fyreslayers). Do we see them getting into a grand Duardin/Ogor coaltion? It's anybody's guess. My prediction would be that Kharadron Overlords always remain independent, as they have a strong aesthetic ripe for future development and have independence baked in. As for the Fyreslayers, I could possibly see them getting combined in a Dwarf 'Gloomspite' style release that emphasizes the three traditional Duardin ancestor gods: Grimnir's Fyreslayers (receiving no new models, as their modest number is sufficient as an army's 'third'), Grungni (who gets an actual model release following his appearance in various novels, and leads a cleaned-up Dispossessed faction with the appropriate Ironweld mixed in) and Valaya (presumed-dead Goddess making a comeback with a small, mixed-gender pious sub-faction). As for the Ogors, it could really go either way. If FEC is anything to go by, Gutbusters have enough diversity to go it alone. Firebellies or even Maneaters could be expanded to a whole subfaction. My guess would be that the BCR remain separate, but hope that they would get a few kits accompanying a fleshed out Gutbuster release. All BCR need to feel like a vibrant faction is rules rewrite and a few extra models. If they released new Yhetees along with a Yhetee Ice Shaman hero, I'd jump on that frozen wagon immediately (the lustre of endless spells and terrain is starting to wane a little for me, but I'd be hyped about massive ice-blizzard pieces. Like, how appropriate would it be to have purple sun sized ice vortexes of the Everwinter? ).